I hope you're all having a fantastic Easter weekend! I've been working on lots of new blog posts and have a lots of new bits from New York to share with you. Before I get to that however I just want to say a big thank you to all of you who've stuck with this blog through my AWOL few months and would you believe it but next Saturday - 14th April - this here blawg turns 2! In honour of this I am giving away a PIXI Beauty make up palette with Angel Armogida. 1. Make sure you are following this blog using your Google account: CLICK HERE TO FOLLOW or hit the blue 'Join This Site' in the right sidebar. 3. Leave a comment on this post with your YouTube username. this is so amazing, thank you for this opportunity sweeties! ahh this looks so cute:] hope i win! Loving the Angel and Kat Combo videos, more please! Hi! Love the palette! Thanks for deciding to share it! Nice Giveaway. Am now following you. Awh this is so pretty! Great Giveaway please enter me.. The colors are so nice, I love pink! Great giveway! I am following your blog and I've just subscribed to the youtube chanel. i folloing ur blog and subscribed the youtube chanel. i've subscribed to your youtube channel-napoleon 152 and subscribed to your blog-b.clay1@yahoo.com. these colors are exactly what i always wear! so pretty! BTW, as an american, i love your accent! it's so cute! Wow would so love to win! My Youtube name is dreamsthatglitterxo1. Following your blog too. Love your posts and would love to win that gorgeous pallete! My GFC is either Abirami Ravintharan or senyorita_usha. Hi great giveaway.i hope to win :) youtube name is 84KittyV. Took me like 15 mins to figure out how to use this, but luckily I did! The palette is absolutely gorgeous!! great giveaway! thank you so much and good luck to all those entering! So glad to find your blog and youtube channel! nhimebaugh both google and youtube! 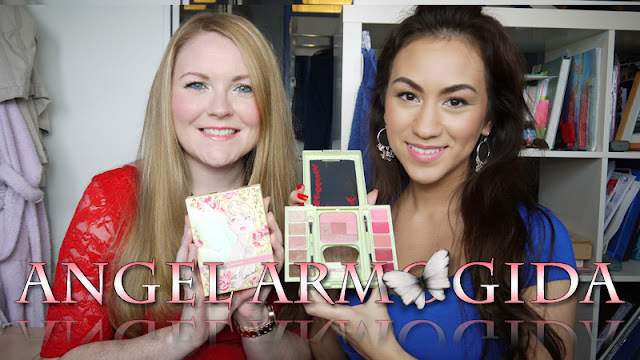 Great giveaway, I loved Angel's tutorial! This palette looks so cute, the eyeshadow colours are right up my street. Thank you so much for the generosity! kat, thanks for doing this giveaway. i went to target last night and saw the palette! it is soooo cool! i really love the colors! looks so good!!!!! !i haven't tried anything from the brand. It´s such a cute palette! This palette is so perfect! I'm in it to win it! What a cute palette. I follow via GFC: BBFF Thanks! Awww the palette is great and the packaging! O_O thank you so much girls!! Youtube is - geo614142 - subscribed and addedon GFC! wow! so nice...my youtube name is KatePPT. My YouTube name is z853www. Thank you!! Fab giveaway. Iv subscribed to your youtube channel. My username is Joanne Dummigan. Would love to win this. Amazing giveaway, gorgeous colours. You tube username: Kim D.